Let’s face it – for us college seniors, graduation is getting closer by the minute and we’re running out of time in our college towns! Sure, there’s the AVG “senior spring bucket list” that everyone has already accomplished their freshman year, but we’ve compiled a list of our top rated, must-see, S&J-approved bars & restaurants in Gainesville for all you foodies. We almost didn’t want to spill our secret on this amazing little French spot, but, of course, we had to give a shoutout to our all-time favorite restaurant in Gainesville! Alpin opened in February 2017, so unfortunately we only have so much time left to dine here before graduating! Alpin is an adorable little French bistro in Downtown, Gainesville. The owners are a husband and wife duo who are originally from Switzerland and Paris and both speak French – Shir’s dream come true! Most of the staff at Alpin speak French as well and are very knowledgeable at their ever-changing food and wine selection. The quaint dining room gives off Parisian cafe vibes and truly makes us feel that we’ve escaped Alachua County for the night! Alpin serves traditional French cuisine, like croque-monsieur and quiche, as well as large salads filled with organic fruits and veggies from local farms. 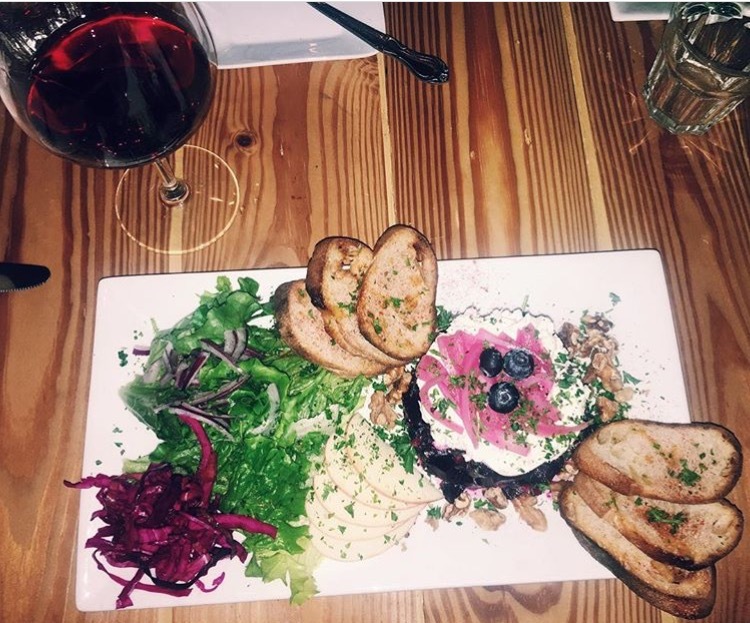 We suggest trying the Brie Chaud cheese plate and the Warm Goat Cheese Salad. They also serve a large selection of wines and have some amazing weekly specials. Our favorite drink is their signature Champagne Rosso, which is champagne with fresh fruit and rosemary. We like to think that Daily Green is the healthiest and most authentic spot in all of Gainesville! Daily Green is a vegan friendly restaurant with a large selection of healthy treats and even an awesome brunch menu. Some of our favorite options here are the Big Belly Burrito, the Heavy Sprouts sandwich, and ANY of their waffle cones! If you’re a health food freak, you can’t miss this place. This cute coffee shop/wine bar built a little restaurant a few feet behind by a park. The restaurant serves only vegan cuisine and honestly, you can’t even tell! The jack-fruit Mac & cheese is AMAZING. IF you’re looking for a study spot this is the place too; there are a ton of picnic tables set up outside with a ton of outlets! It’s open until midnight, so PERFECT for you night owls who like to study later in the day. We recommend the matcha! This little cafe recently opened in Gainesville, but is known to be a favorite in Tallahassee. Vale is all about healthy options and good portion sizes! If you are a vegetarian, there tons of options for you and even some fun treats like the Acai Bowl and Avocado Toast! We love cafes like Vale that take the “Chipotle bowl” concept to the ultimate foodie level. If you’re looking for authentic Japanese ramen, this is the place to go! There is a bar with an amazing selection of cocktails and good happy hour deals. If you’re a vegetarian there aren’t many options, but the veggie ramen bowl is TOO DIE FOR. (get hot sauce on the side, you won’t regret it. If you’re looking for craft pizza – look no further! This little spot is attached to Cymplify, which we all know and love their coffee, as well as Big Island Bowls, another local acai spot. They have a great selection of pizza options, but our favorite is to make your own with tons of our favorite veggie toppings! This place has a great atmosphere for a fun date night. They also feature vegan and vegetarian salad and sandwich options. This is our go-to brunch place if we have a long free day! All the food is fresh and the food selection is extensive! Weekend times are a little weird and the menu is smaller, so just make sure to check online before making your way over, because it’s a little bit of a trick from campus!